Hi, my name is Twinkle. I came to Mylestone when I was about 9 months old with my best friend Madeline. I was starved, full of worms and had lice. It took awhile, but everyone here finally got me in great shape. I was born with a bent nose which means that my top teeth don’t line up with my bottom teeth. 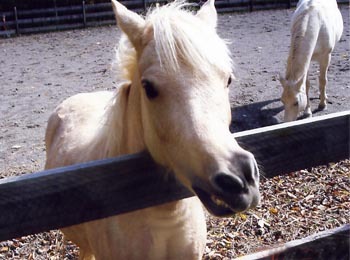 I have to have regular visits from the horse dentist. I also have clubbed hooves. My poor condition was greatly due to the neglect I received as a baby. 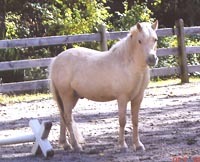 I am a small pony. I am very friendly and like attention; sometimes I can be fresh, but thankfully, that didn't stop me from getting a wonderful home. 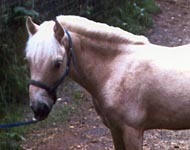 In the time Twinkle was with us, he was a companion to many horses, from Madeline, with whom he arrived, to the Premarin foals, to a blind Appaloosa named Nicky who has since passed away. Mylestone was grateful for all the help Twinkle offered to so many rescued horses, but we hoped he'd find a home of his own. Vicki and Ken were looking for a companion for their horse, Punch Landed, and Twinkle seemed just the right one. The two became buddies quickly, just as Twinkle became a real family member in no time at all. Vicki and Ken's young son kept calling Twinkle `Wish', and Susankelly said the little boy was right - Twinkle got his wish - a family of his own.